Friday The 13th films are well known for being heavily censored by the MPAA to obtain an R rating for theatrical release. However, certain films endured more cuts and editing than others to appease the rating board and Friday The 13th: A New Beginning ranks near the top for censorship supremacy. A few weeks ago, we wrote about Jake's censored death in A New Beginning and discussed the amount of work that went into preparing his death scene. It is a real shame that fans never got to see the finished product and the same can be said for the death of the character Robin (Juliette Cummins). Her death in the finished film was lackluster at best, but it was due very much to the cuts made to the scene. However, we just discovered a very rare photo posted at the F13 Community and it is awesome! In Robin's death scene, she lays on the top bunk bed and is grabbed by the neck from below by pseudo Jason. 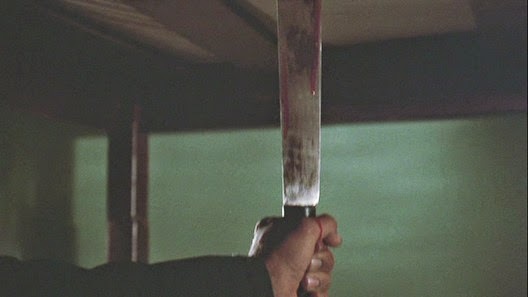 The machete is shown to pierce the bottom of the bed and then slide back out, but we never actually see what happened to Robin. Now with the image below, you can see how graphic a demise the character was to suffer. The blood spirting freeze frame is a pretty cool sight and now we wish this scene existed on film even more so. It's unlikely, but perhaps the lost footage from A New Beginning will be unearthed from someone's basement, attic or warehouse some day in the near future!